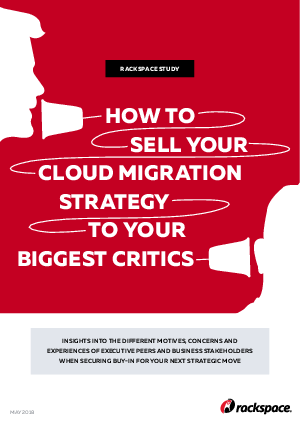 > Research Library > Rackspace > How to Sell your Cloud Migration to your Biggest Critics. The decision to move business workloads and applications to the cloud impacts all parts of the business and isn’t a decision isolated to the IT team. Our latest research study on the different motives, concerns and experiences of executive peers and business stakeholders when securing buy-in for a strategic IT move found 97% of C-level executives in ANZ suffered from migration regret during their first cloud migration. Packed with telling hindsight, over 200 c-suite executives shared their expectations and experiences during the cloud migration journey. They reveal what they would have done differently - namely enhanced communication and a clear plan of action - and offer practical advice to help others get buy-in internally and secure funding to support a move to the cloud.